To acquire oil art paint. You will need paint thinner. Now it is a picturesque basis on which you will draw. 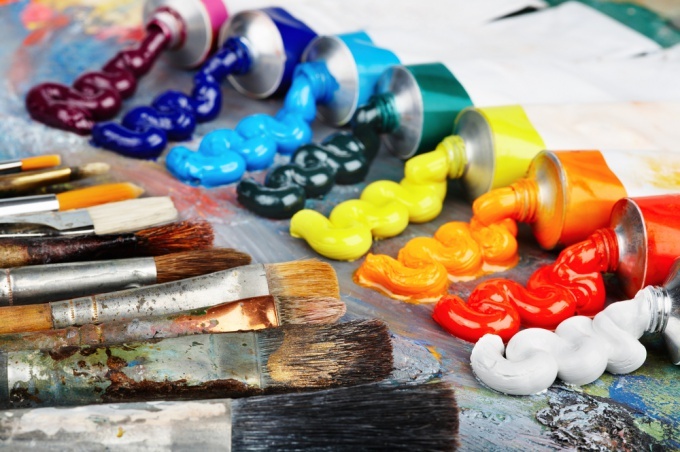 Oil paints can be paint on rigid, semi-rigid and flexible basis. Rigid base — Board and plywood, hardboard and particle Board, metal Board. Semi-rigid base — Board. Elastic material — canvas. Canvas as painting framework is most prevalent. Better if for the first experiments you will acquire a primed canvas, cardboard or plywood. It is advisable to purchase an easel and sketchbook. Paint-mixing will need a palette. Buy the plastic, or use as a palette, a white dish, ceramic tile. Brush is what you will draw. They come in large, medium and small, hard and soft, flat and pointed end. Best brush from the hair kolinsky, weasel and squirrel. For the first time buy 3-4 different size brush. Now you have everything to paint with oil paints. Of course, it's good to acquire any benefits in painting, to explore the concept of perspective, composition, main properties of color and light. Think about the theme of his first work, composition, perspective, color scheme, paint your design on the canvas and start painting in oil. underpainting — the first registration pattern color, the preparatory stage. It is performed with a thin layer of liquid paint on a primed basis. Underpainting can be done with one tone, in black and white decision, or multicolor. registration. On a well dried underpainting is made further residence. Each residence should have a good dry. the glazing — on the dried out the resident applied the final layer is thin, transparent and translucent strokes. Alla prima — with this method the paint is placed on wet basis, in a single layer. This kind of oil painting gives you the opportunity to finish the study in one session and is more simple in technical terms. Until the paint has dried, you should try to write as much as possible. To write on wet paint as long as it allows you to mix with other colors. Try, experiment, copy of old master paintings. Discover the benefits of different genres of oil painting — it will help you to achieve faster progress.